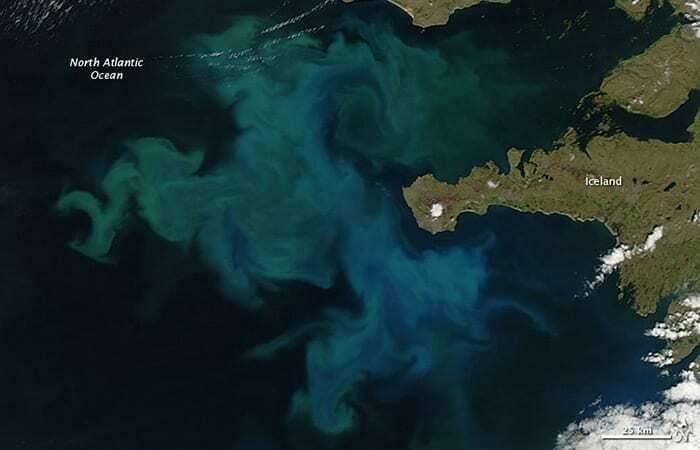 When conditions of light and nutrients align in the surface waters of the ocean, tiny single-celled algae called phytoplankton respond with explosive growth and reproduction in a phenomenon known as a phytoplankton bloom. “As scientists looking in the microscope, we have an excitement about these organisms and their power to shape the world that we want to share, but we can’t always do it in the most compelling or meaningful way,” said Elizabeth Halliday, who recently earned her Ph.D. in biology in the MIT/ WHOI Joint Program in Oceanography. 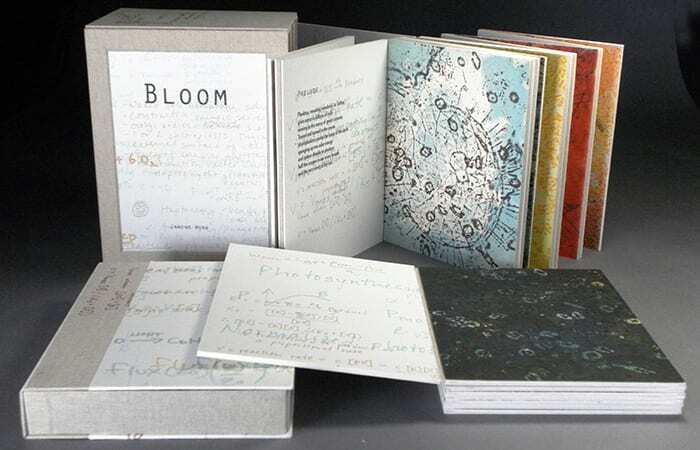 “Janine was really interested in having different ‘languages’ tell the story of the bloom,” Halliday said. 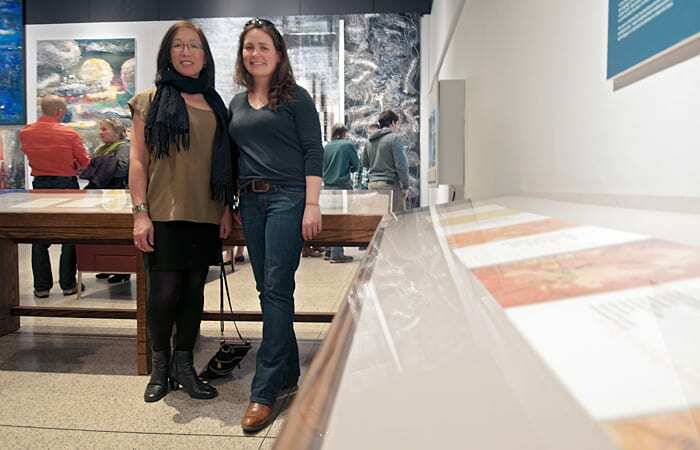 The first language was etched prints, using real microscopic images taken by Halliday’s Ph.D. advisor, Rebecca Gast, while conducting research aboard the research vessel/ice breaker Nathaniel B. Palmer in the Ross Sea, Antarctica. The second was something between images and texts—diagrams, thoughts, and equations from Clayton’s laboratory notebooks. The third was traditional text to tell the story, to be contributed by Halliday. “I was excited to help out and came back with a five-page essay describing what happens during a bloom and why it is important to the health of the ocean and people everywhere,” Halliday said. “Janine read through it and underlined a few phrases that she liked. When we met, she pointed out there really wasn’t room for this much writing in the book, and who would saunter up and really read it at an art gallery anyway? She said she saw a poem hiding in it. in waters redolent with potential for growth. Waters are renourished from winter mixing, and now warmed by the sun. respond to the windfall of light and nutrients. honeycombed with pores, each pore a portal between cell and sea. but always consisting of a top and a slightly smaller bottom, snuggly fit together like a lidded cookie tin. but to split the house apart when it divides, birthing two identical daughters. Their inheritance: half of a glass house and a genetic dictum to rebuild, to replicate. endowed with extravagant spines, stretching their surface area to slow inevitable sinking. blue ocean, produces oxygen equivalent to that produced by the rainforests of the world. But in the sea, the same goods carried by phytoplankton are rapidly consumed, recycled. of bacteria and phytoplankton, each cell invited to the inner sanctum for digestion. it is presented to you as the Catch Of The Day. that was appropriated from our overburdened atmosphere, and now rests sequestered. With bloom comes bust. Necessary nutrients become scarce, reproduction unmanageable. that eventually will rise again, conveyed by currents to fuel blooms of future centuries.